Limbaugh on Obama: "I hope he fails." When asked about his hopes for the Barack Obama presidency, radio talk show host Rush Limbaugh infuriated Obama supporters with four simple words: "I hope he fails." But it is important to take Limbaugh's words into context with his entire statement on the matter. (You can watch a video here.) 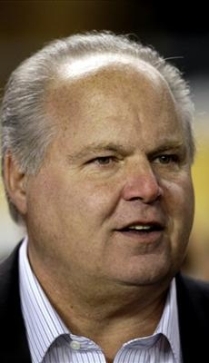 Does Limbaugh actually want Obama's presidency to fail, in that he wants the country to suffer? What Limbaugh actually said is that he wants Obama's policies to fail, meaning the defeat of President Obama's legislative agenda. This is because Limbaugh believes Obama's policies will be ineffective, counterproductive or destructive. This is a view I share. As I said in my letter to the editor in the Indianapolis Star, many Americans have serious philosophical differences with Obama on matters of public policy, and "it is foolish to expect these differences to be brushed aside in the name of 'unity' or bipartisanship." I also hope Obama fails, especially regarding his promise to sign the so-called "Freedom of Choice Act." (I will write more on FOCA later.) I hope the Republicans and enough conservative Democrats defeat that in the House or Senate. I hope Obama fails to increase taxes, which is exactly what he promised to do when he said he supports rolling back President Bush's tax cuts. I hope Obama fails to get legislation passed to expand "hate crimes" at the federal level. The top item on Obama's legislative agenda right now is a massive economic stimulus package. Back in 1993, President Clinton attempted to push a $16 billion economic stimulus package through the Congress, only to be blocked by a Republican filibuster in the Senate. Now, Republicans are considering getting on board with Obama's stimulus, which leaves the Clinton package in the dust. Have Republicans given up on being the party of limited government? While Republicans have lost a lot of credibility as the party of limited government with Bush's big-government agenda, there is no reason why they cannot reverse course and stand on libertarian principles as they did in the 1990's. Beyond objections to Obama's legislative agenda based on effectiveness, there are questions about the role of the federal government that must be considered as well. As the government gets bigger, spends more money and takes more in taxes, we lose more and more freedom. The stimulus package pushed through last fall by Bush (after being delayed when the House Republicans revolted) was a huge expansion of government's role in the economy. Do we really want to give the government even more control of the economy? Do we really want to take several more steps toward socialism? Obama has made two significant political miscalculations in the first couple weeks of his Presidency. First, it is a mistake to complain about Limbaugh and encourage Republicans not to listen to him. For the leader of the free world to whine about a radio talk show host shows weakness and an inability to take criticism. Obama does not need to look like a crybaby this early in his presidency, especially considering his party expanded their control over Congress. I expect Limbaugh to be attacked through Obama's surrogates, but Obama would be well advised to avoid criticizing Limbaugh directly. Second, in discussions of the stimulus, Obama reminded Republicans that he won the election and said "I'll trump you on that." This displays an arrogance that is unbecoming of a President. Yes, elections have consequences and it is expected that Obama will implement his agenda, not a GOP agenda. But there is a difference between governing based on that and acting like a sore winner. Obama would be well advised to remember that the 2010 campaign will be in full swing in less than a year, and he could see his Party's hold on Congress weaken or vanish. On a personal level, I wish Obama the best and I hope this country enjoys peace and prosperity for the next four years. However, in terms of policies that expand the role of government, increase taxes, or advance a destructive social agenda, I agree with Rush Limbaugh. I hope Obama fails.